When it comes to the best role-playing board games there are so many to choose from. Board games have been around for centuries and unlike classic strategy games such as chess or draughts, roleplaying games gives players hours of enjoyment and let them become the characters. There are different types of games but most include an element of strategy. On this page of our site, we are going to look at the most popular tabletop RPGs including classic titles like Dungeons & Dragons. 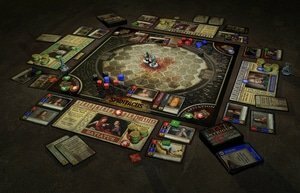 What Are Role-Playing Boards Games? Players play as characters that have names and histories and the players can even create the characters and their history through the choice they make in the game. In the best role-playing board games, players are only limited by their imagination and the logic of the game's world. Even if involved in a combat situation, players have a number of choices. They can let their character play dead, beg for their life, dance, sing, or whatever action they can think of. The object of the game is also what the player wants for their character whether this is to become king, build a temple, conquer the enemy, protect their family, and so on. The most popular tabletop RPGs can be played for hours on end and players act out their role by describing what actions their character will take based on the rules of the game. In most games, there is a special player called the Game Master (GM) who is also known as the Dungeon Master in Dungeons & Dragons. This player creates the setting in which each player plays the role of a single character. The Game Master describes the game and its inhabitants as well as the outcome of the action the players take. 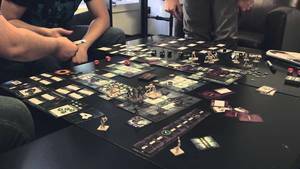 Below you will find the best role-playing board games that you won't want to miss. These are some of the most popular tabletop RPGs ever. Dungeons & Dragons: This has to be the most popular tabletop RPG ever invented. It's a great game that is easy to get to grips with and it has been around for more than four decades with new adventures and add-ons created all the time. It is in fact, the world biggest RPG and it is easy for new players to enjoy. There are plenty of new digital tools available to help newcomers get started too. If you enjoy fantasy, magic, lots of great new quests, then Dungeons & Dragons is the game for you. Cyberpunk: This game was released back in the 1980s and is a gritty sci-fi sub-genre title that features diverse characters such as hackers and mercenaries as well as advanced tech. There's combat between human and machine too and although the original game was set in 2013, later editions have moved the setting to 2030. This is a great role-playing board game for fans of Blade Runner and William Gibson novels. Fiasco: This game was inspired by tales of hapless criminals and it captures the comedy of films like Fargo. There is no need for a Game Master and there's no preparation needed either. The action is all done using the imagination and a six-sided dice. If you're new to RPG game this is the perfect choice and will be a bit hit with fans of the Coen brothers, those who don't want a GM, and those who don't mind screwing up every now and again. Adventures in Middle-earth: You need to have the Dungeons & Dragons' fifth edition to use this Lord of the Rings inspired set of books, it is a great choice if you are a fan of Tolkien's fantasy series. The game is set after The Hobbit and the player's guide provides all the rules needed to create characters rooted in the lore of this world. There are various supplements that add more races, creatures, and locations too. Call of Cthulhu: This is the best role-playing board game for horror fans. It is set in a world of monsters and murderous occultists created by H.P. Lovecraft. It differs from a lot of the roleplaying games by making players' investigators physically and psychologically fragile. Characters don't have classes, instead they have to use their skills to stop the world being destroyed. Players can spend hours trying to solve a mystery only to end up dead or insane. This game has been one of the most popular RPGs for more than 30 years and is perfect for fans of scary movies, Lovecraft, and mysteries. Settlers of Catan: This game was released in 1995 and is still a very popular title. It takes a couple of hours to play and players have to try and be the dominant force on the island of Catan by building settlements, cities, and roads. Each turn sees dice rolled to determine what resources the island will produce. Players collect the resources to build up their civilizations. They have to get to 10 victory points to win the game.